I was in Iraq in 2016 and served families then that had been displaced and were homeless from fleeing ISIS. This is a return trip to visit them, encourage them, and run the marathon for them! The marathon (26.2 miles) is a international event to promote goodwill and peace in the region among people of different cultures, tribes, religions, and nationalities. I like to combine my athletic pursuits in running and triathlons with causes that can make a difference. In short, I believe we are here to each “add value”! 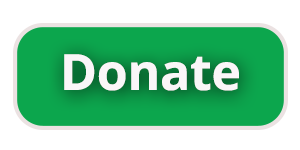 You can give towards my Iraq Race Fundraiser on the Iraq Race donation page of iGive Global by clicking the button below. We may not be able to help everyone, but we can help more than one! Will you join me? Follow #IraqRace on Instagram and Twitter for updates! I traveled to Iraq in 2016 for the first time out of a mission to help. I had read reports of over 100,000 people needing to flee Mosul and the surrounding area where ISIS overtook the city. These families, Muslims and Christians, who had lived together peacefully for decades, were forced to leave everything they had and flee with the threats to their lives being real and immediate. Many had 24 hours or less to get out. They left everything behind. Initially moved to tent camps, we helped families get into apartments in Erbil and supplied them with needed items on the trip I was part of. Now, with the liberation of Mosul in 2017 by Iraq, many can go back to their homes but the devastation from ISIS and the urban warfare to take the city back is massive. I like to compete. I like to add value to others. I’ve been bringing the two together in various ways to raise funds for organizations I believe in over the past 3 years. This will be my biggest “add value” yet! In 2017 while reading some news updates about things in northern Iraq I came upon information about the Erbil International Marathon. The marathon has a wonderful history and story of being an international event to promote “love, peace and non-violence in Iraq.” The marathon was not held in 2017 due to some unrest in the region and is now back on for 2018 and I plan to be there to participate! 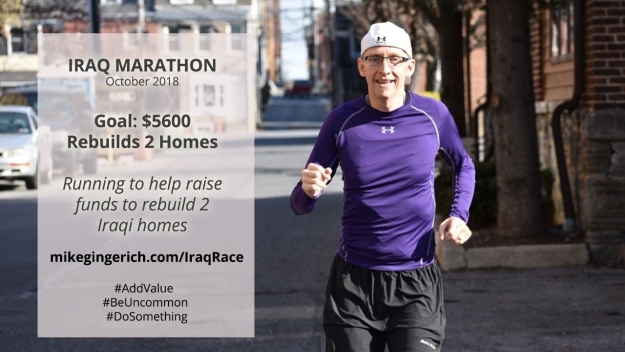 For me it’s a physical challenge taking on 26.2 miles, a opportunity to return to visit those I know in Iraq, a way to bond with other runners and be part of a marathon cause I can support, and a visible event to focus on to bringing awareness and funding to families in great need in the region who want to go back to their homes. I want to help, and you can join me in making this a reality! I’m aiming to raise funds to repair at least 2 homes…in reality I’d love to blow that goal out of the water and do much more! Together we can. I’ll be sharing news about my training, fundraising and more in the days ahead of the trip. As well, if you join you’ll get emailed details on how things went, photos, videos, and stories from my time there. Sign-up below!